"Blizzard (move)" redirects here. For information about the Ice Climbers' special attack in the Super Smash Bros. series, see Ice Climbers § Blizzard. 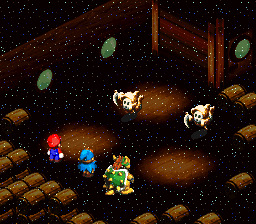 Blizzard is an ice-based attack used by enemies of Super Mario RPG: Legend of the Seven Stars. It is used by enemies who use ice attacks, such as Greaper and Valentina. The attack hits all party members. This page was last edited on April 9, 2019, at 16:13.